A professional rug cleaning is necessary to thoroughly remove stains, dirt, odors and allergens from your rugs. A pre-inspection will reveal if there are any permanent stains and allow the us to determine rug construction and materials. Then, we will perform a thorough vacuuming of the area rug to remove debris. Then, a professional pre-spray and spot treatment will be applied before we use the advanced rotary extractor to scrub every fiber of rug from all directions. This method flushes the carpet with a cleaning agent that removes bonded dirt and grit. The multiple vacuum slots then removes the water immediately after spraying it. Then we perform a post-spot treatment to work out the trouble spots. Next, we groom and dry the rugs to complete the process and leave your rugs beautifully clean! 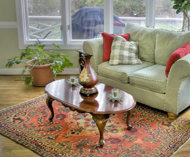 A cleaning that will restore rugs to their former softness and vibrance is not a do-it-yourself job, but a job for a professional. Call Richard at UK Cleaning today to get the best, most effective, and safest rug cleaning - guaranteed.